Ron Schuchard, the Goodrich C. White Professor of English Emeritus at Emory, discusses the connections between the poetry of Thomas Hardy and Seamus Heaney from the actual to the marvelous. Living Poets Society Poetry Bookclub Meeting -- "Seeing Things"
Living Poets Society, the BBS in-store poetry bookclub, will be reading and discussing Seeing Things by Seamus Heaney. Please note that the November meeting will be held on the Third Tuesday of the month, instead of the second. Seamus Heaney discusses Stepping Stones. Seamus Heaney's book The Art of Losing was available from LibraryThing Early Reviewers. 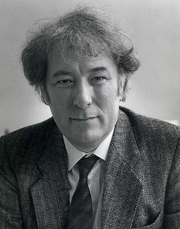 Seamus Heaney is currently considered a "single author." If one or more works are by a distinct, homonymous authors, go ahead and split the author. Seamus Heaney is composed of 34 names. You can examine and separate out names.